‘Look for the smallest try and build on that…’ Jason Mayhew. She was a natural swimmer from an early age. Let me take you back now to an evening last Summer when I watched with mounting panic on the lakeshore as my four month old puppy swam further and further into the lake. I was not on my own that evening, two of my friends watched also. She swam in circles, splashed, bit at the water and swam on and on. No amount of coaxing, cajoling or threats from the shoreline made a blind bit of difference….Uisce had discovered the delights of water and learnt to waterfreak… And I knew it was not simply a matter of letting her grow out of it. I had read all about waterfreaking in chesapeakes, something that’s more prevalant in our beloved brown dogs than in the other retriever breeds, it does not make for optimistic reading. Many of the very experienced trainers in the US have theories on whether it follows certain lines or whether it’s an obedience issue but one thing they absolutely all agree on is that it’s notoriously difficult to correct. Up until this point Uisce was swimming very well she was comfortable and confident in water. I hoped that she was young enough and that the pattern was not deeply ingrained to be able to do something about it.. In the immediate aftermath it made me very nervous having her around water. I knew that until her land recall was one hundred per cent it was just not worth taking the risk of letting her swim at the lake. So over the winter I worked on her land recall, taking her out more on her own so her focus was on me and not the other dogs. Getting basic obedience well ingrained like heelwork and her hand delivery of retreives. It would be the latter that was to be key in gaining control in water but until it was near perfect I would not take her near open water. I must add at this point that I sought advice from all quarters and am extremely grateful to everyone who offered their opinions as a combination of many suggestions inspired me to push on and work through this problem but it was that one single sentence of Jason’s which helped me most. If I had looked at the bigger picture, at that point, I would have got frustrated with her and possibly given up. By changing my immediate goals with her and looking no further than searching for small improvements in her attitude helped us both in working through a problem that I really had no confidence was going to ever have a positive conclusion. During the winter I curtailed her access to swimming water greatly. I used a small river, she was only allowed swim upstream and never for a retrieve. Her reward for swimming correctly was simply to be allowed to swim and if she came out of water when asked I let her back into the water. In a very short while I could see a shift in her response, she could break away from swimming if I asked her and a small vocal correction of ‘ah, ah,’ was enough to stop any splashing if it started. If she didn’t listen then I called her out and we walked away. I never rerimanded her as I felt that in doing so it may bring its own problems with perhaps reluctance to enter water in the future. I worked consistantly on her land work in conjunction with this. Lots and lots of heelwork, recall work and perfecting a good hand delivery. She has proven to be a very compliant pupil. She is the first of my chessies that I have successfully worked with treats as a motivator. Once I was confident with her land work and she was walking to heel with a dummy I started reintroducing her to water. Starting with walking hold in the many, many flood ponds around the farm at home. If she managed this without trying to splash the water she was praised verbally and with treats. The next stage was retrieve and it was at this point that we had the most speed wobbles. I tried her initially on retrieves up river. Her run out was impeccable but once she dipped her head to take hold of the retrieve it all became a game of bob and splash, she would forget the dummy and launch herself off into the water again. This really was the most frustrating part and very difficult not to lose my temper with her. However, there were positives even at this stage and many’s a time on the walk home on reflection I could see improvements. Her recall was much better and I could snap her out of that hypnotic trance much more quickly than before. It was Jason that suggested, at this point, to try teaching a retrieve from across water rather than in water. This is where I really started to see some light at the end of the tunnel. The first morning I tried this I was with my friend Mariann. We had done some nice walk ups and land retrieves. 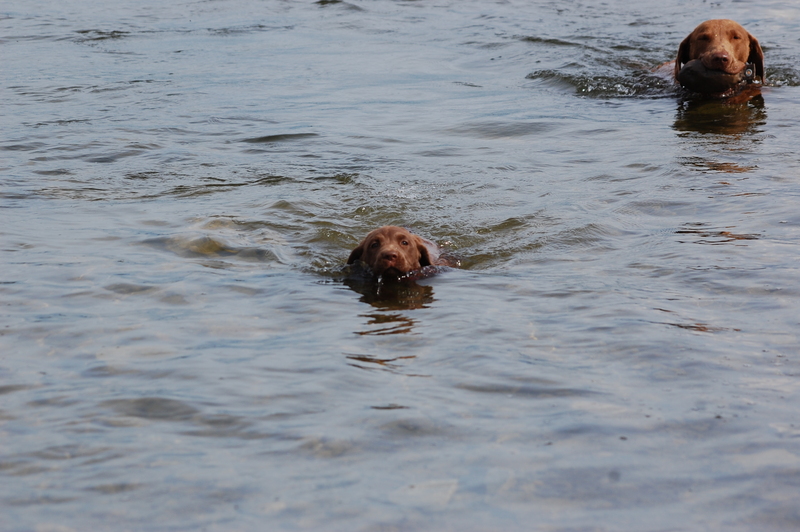 I had found a narrow channel that was perfect to try out my plan for retrieving across water. I stood one side with Uisce and Mariann threw the dummy on nice open ground on the far side. It worked perfectly. I was so delighted that I made the fatal error of repeating the retrieve, I sent Uisce again and she brought the dummy to the edge of the bank on the opposite side, dropped it so it rolled down the side and took great delight in sliding down after it, into the water and started splashing. My heart sank but I knew it was my fault. I called her up and we headed for home but again on reflection I could see small progress. Over the next few days I mulled it over, there had to be a solution. I was missing something in the chain, it’s another great thing about chessies in training if you skip a step in anything you’re teaching they’ll find it and fill in the gap for you, with their own twist. I was convinced the answer lay in solving her issue of picking and carrying a retrieve in water..how to figure out getting past this stage was the clincher. I took her to the estuary, the same point where she swam off out to sea last summer. Using a very light,long cord and collar I put the dummy in her mouth and walked her in until she was out of her depth…I had waders on. Once she swam normally and with no problems, I removed the dummy and she was praised as she would be on land. This was repeated several times in one session. The next session I did the same excercise and once I felt she was comfortable with this I threw the dummy to shore and sent her giving the command to hold when she started swimming back to me. When she could do this fluidly I then started throwing the dummy to the water’s edge so she was picking it up in very shallow water, then I worked on her retrieving parallel to shore and finally sending her from the shore into the water. Once she grasped the concept of picking up in water everything else fell into place and because I had worked so consistantly on recall and hand delivery her overall finish on a water retrieve is really very nice. I never made the mistake of overloading her again with several retrieves. If she does one correctly she gets plenty of praise, treats and a fun retrieve from land and thats it. So far we are making progress, the video clip below was taken at the lake last week. Her first trip back since last summer and I was happy with the result. There are still moments when she loses concentration, typically it’s on the first send but the need to correct this is becoming less frequent. http://youtu.be/ce022yo0Kbk My aim for this summer would be to get a good consistent seen retrieve to novice level without any hitches. Then it will be water blinds but small steps and small tries will hopefully move us forward. This entry was tagged retriever training. Bookmark the permalink. ← Dogs and desserted beaches….